A couple weeks ago I saw this pretty blue fox fur vest by Timo Weiland (on sale) and I knew I just had to have it. The printed lining and dyed blue fur are unexpected and give the typical fur vest a fresh and modern update. Surprisingly, it goes with a lot! It makes me crave a trip to Aspen – doesn’t it look like it would fit right in? I brought it to NYC and plan to wear it this weekend to a blogger brunch hosted by Mackenzie Horan of Design Darling. Because of the freezing temps, it’s important to layer properly and this definitely will do the trick under my J.Crew coat. I hope you’re enjoying all of my fashion week posts on Instagram so far – more to come! Have a great weekend! This vest is amazing and that’s a I call a great sale. Good buy and have fun in NYFW. WOW! Love this whole outfit! The boots are fantastic! I’ve been thinking about getting a little fur vest and tried one on the other day. Have fun in NY! Love your pics! 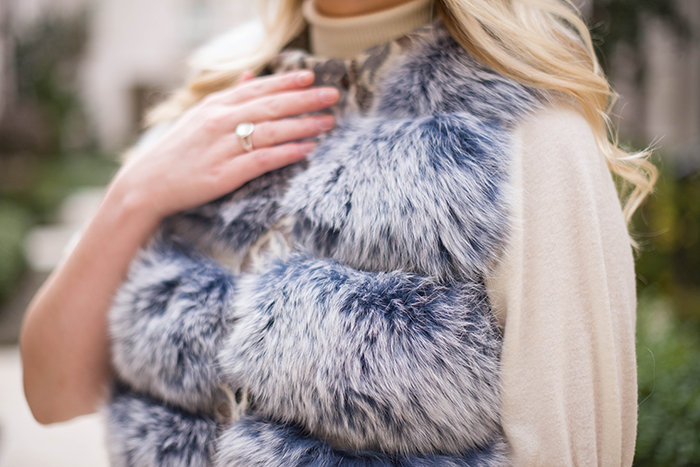 Love the vest–it’s the perfect item for this ridiculous NYC weather! You look so cute in that vest! And of course, you’re wearing my fave boots of all time! That shade is just so beautiful! Love the pattern details. See you Sunday! This is such a gorgeous ensemble! You look so great in these colors! Your closet is having a major baby blue moment right now, and that’s perfectly fine with me. The brocade-esque lining of this vest is so unique. I’ve never seen anything like it. This vest definitely screams “Take me to Aspen!” but it will also come in handy in NYC…our weather here is so unbearably cold! 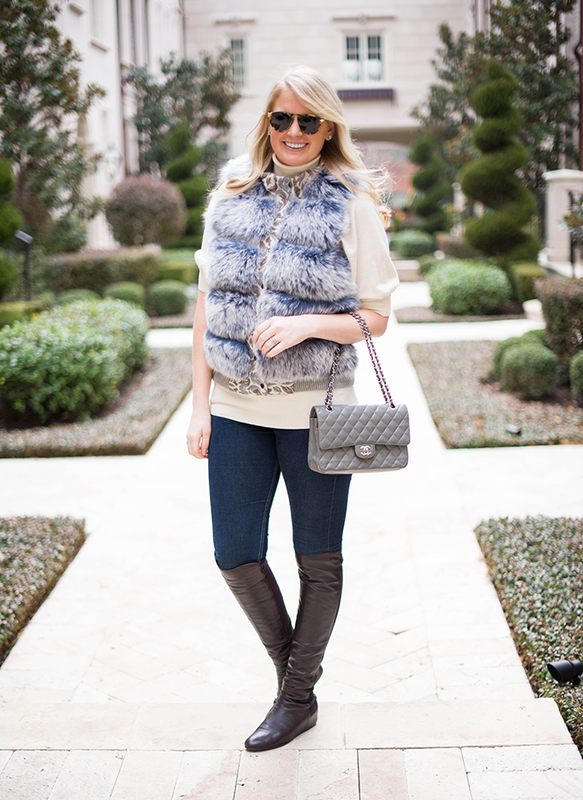 The vest is kind of fabulous- you look amazing! I can’t wait for Timo’s show tomorrow. I’m hoping it’s a good one because this vest is stunninggg.